Click to enlarge each image. 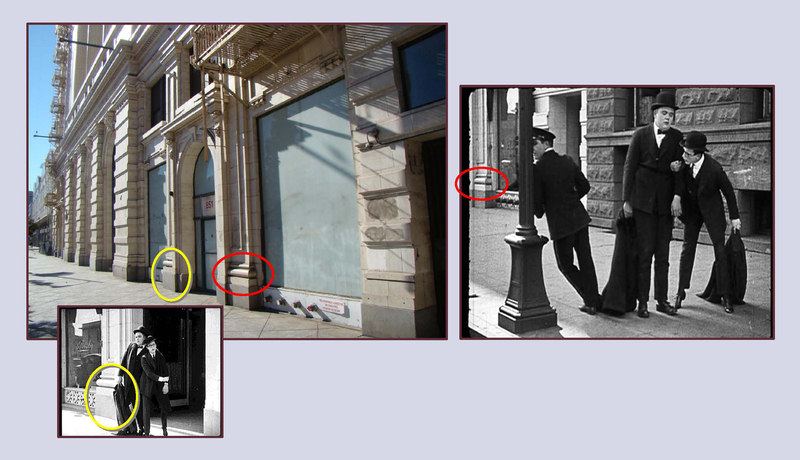 Then and now – Charlie Chaplin strolls to work in The Bank beside the Trinity Auditorium. NOTE: after first posting this story with DVD images Flicker Alley has since released its Blu-ray restorations, and the new picture quality is amazing! You can now see bystanders inside the building (see below) watching Chaplin perform. 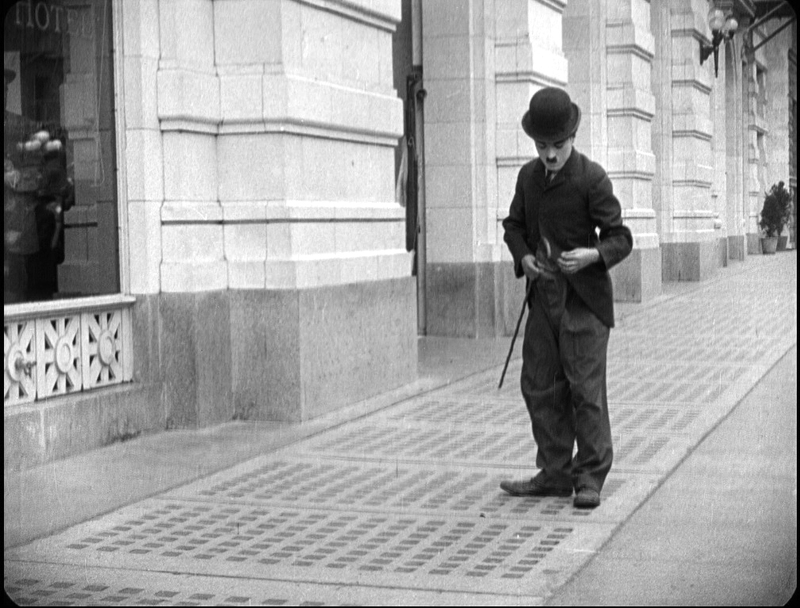 Charlie Chaplin’s Essanay comedy The Bank (1915) marks his final cinematic footsteps in downtown Los Angeles. While Broadway, and other nearby Historic Core streets appear in several of his early Keystone films, including Making A Living, His Favorite Pastime, The New Janitor, and especially His Musical Career, discussed in this post, Chaplin would never again stroll these urban sidewalks to make a movie [note: City Lights (1931) includes scenes of Charlie and the drunken millionaire, perhaps stunt doubles, driving around several downtown corners, as shown in this PDF tour]. Thanks to preservationist Serge Bromberg of Lobster Films, and Cineteca di Bologna, all 15 of Chaplin’s Essanay short comedies from 1915 are now beautifully restored, available as a 5 disc Blu-ray/DVD box set from Flicker Alley. Click to enlarge. Matching elements of the Trinity Auditorium, 851 S. Grand Avenue. USC Digital Library. The Bank opens with bank janitor Chaplin strolling to work beside the Trinity Auditorium Building, later known as the Embassy, located at 851 South Grand Avenue near Ninth Street. The first three stories were dedicated to the Trinity Church, while the upper six floors housed a men’s dormitory containing 330 rooms and a rooftop garden capped by a 70-foot diameter dome. The complex featured a library, a gymnasium, tennis and handball courts, a cafeteria, a cafe, and a barbershop. The church’s goal was to satisfy the requirements of mind, body, and soul. “We can take a man from the shower bath to the pearly gates” said Rev. C.C. Selecman when the facility opened. 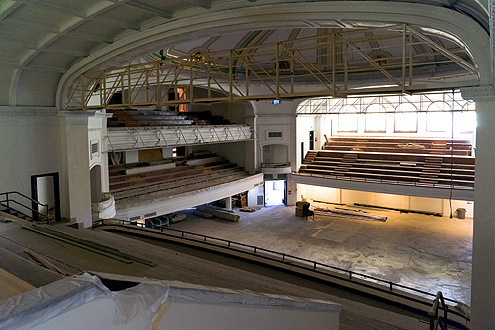 The auditorium renovation (Photo Hunter Kerhart) – DTLA Rising by Brigham Yen. The 2,500-seat, three-tier auditorium, with elegant reception halls, and a banquet hall that could seat 1,000, was once the center of Los Angeles culture. The September 21, 1914 opening night concert featured basso opera singer Juan de la Cruz. The Los Angeles Philharmonic, the city’s first permanent symphony orchestra, made its debut here in 1919, playing Dvorzak’s New World Symphony. By the 1930s the hall was known as the Embassy, a celebrated venue for jazz concerts featuring Duke Ellington and Count Basie, while rock concerts played here in the 1960s. Located in the burgeoning South Park entertainment district, a few blocks from the massive Los Angeles Convention Center and Staples Center complex, the Embassy is being converted into an Fen Hotel. The Trinity was a popular early filming location. Here it appears behind Harold Lloyd during Bumping Into Broadway (1919). Jovial inebriates Harold Lloyd and Roy Brooks stagger near The Trinity during High and Dizzy (1919). 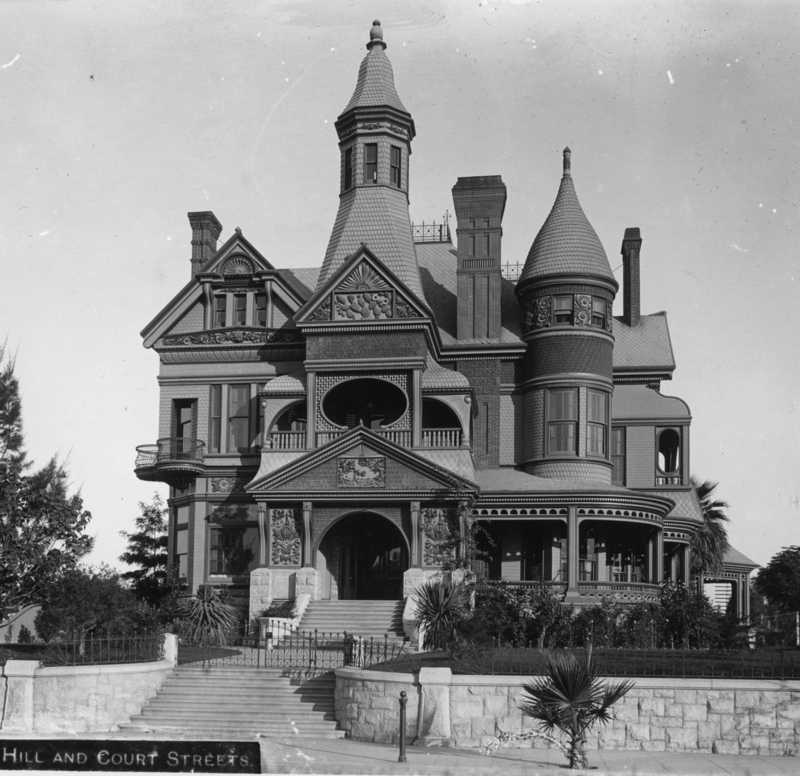 The Bradbury Mansion. USC Digital Library. Work was Chaplin’s last Essanay project completed at the Bradbury mansion atop Court Hill (see post HERE). In June 1915, Chaplin and company moved to larger quarters at the rented Majestic Studios located at 651 Fairview Avenue in Boyle Heights, where The Bank was filmed on a large open-air shooting stage pictured below. Chaplin (2nd from left) and crew posing at the Majestic Studio. David Kiehn. This wonderful shot below shows most of the cast and crew during The Bank‘s production. Notice the muslin light diffusers hanging over the open-air stage. Essanay historian David Kiehn’s book Broncho Billy and the Essanay Film Company identifies nearly every person in this shot. Producer Jesse Robins appears at both ends of this panoramic photo. He accomplished this simply by walking behind the camera from one end of the group to the other during the exposure, as the camera slowly pivoted from left to right. The arrows identify matching details of the bank set as they appear in the film and in the group photo. The desk, bank vault, checkerboard floor tiles, and grand staircase evident in the movie frames appear in the right part of the photo. All images from Chaplin films made from 1918 onwards, copyright © Roy Export Company Establishment. CHARLES CHAPLIN, CHAPLIN, and the LITTLE TRAMP, photographs from and the names of Mr. Chaplin’s films are trademarks and/or service marks of Bubbles Incorporated SA and/or Roy Export Company Establishment. Used with permission. HAROLD LLOYD images and the names of Mr. Lloyd’s films are all trademarks and/or service marks of Harold Lloyd Entertainment Inc. 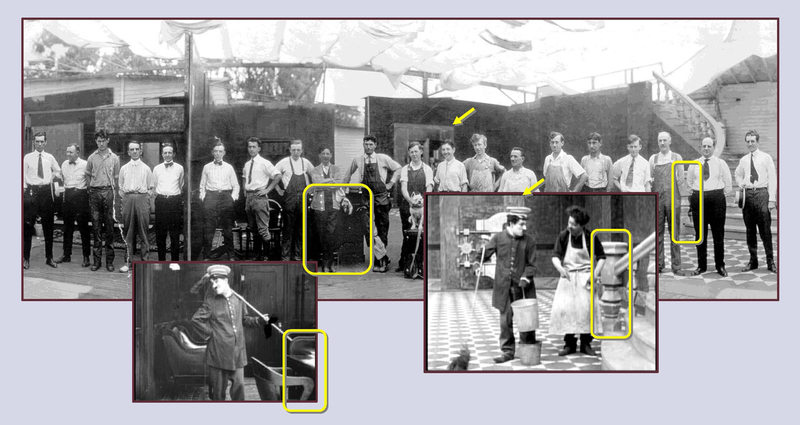 Images and movie frame images reproduced courtesy of The Harold Lloyd Trust and Harold Lloyd Entertainment Inc. The Trinity at 851 S. Grand Avenue. This entry was posted in Charlie Chaplin, Harold Lloyd, Los Angeles Historic Core and tagged Bumping Into Broadway, Chaplin Locations, Chaplin Tour, Charlie Chaplin, Harold Lloyd, High and Dizzy, Hollywood, Silent Comedians, Silent Comedies, Silent Movie Locations, Silent Movies, The Bank, then and now. Bookmark the permalink. Thanks Bill – I hope to be able to see the restored interior some day. “The Embassy” is really a magnificent building. I hope to God they never tear it down.